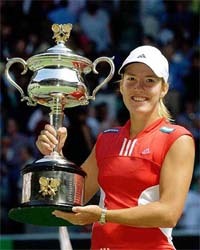 Justine Henin-Hardenne beat her fellow Belgian Kim Clijsters 6-3, 4-6, 6-3 in the women's singles final at the Australian Open today. Henin-Hardenne, 21, added the Melbourne Park trophy to the French and U.S. Open titles she won last year to strengthen her hold on the number one ranking. "It's a pleasure to play in Australia, I'll be back again next sure," a beaming Henin-Hardenne said. Top of the world and seemingly untouchable, Roger Federer is a red-hot favourite to slay Russian goliath Marat Safin in the final of the Australian Open tomorrow. After becoming the first Swiss man to reach number one, second seed Federer will be anxious that his ascent to the top of the world rankings does not fall flat against a resurgent Safin. India’s Karan Rastogi went out in the semi-finals of the boys’ singles at the Australian Open in Melbourne on Saturday. India would return to near full strength when they take on world champions Australia in a dry run, before the finals of the triangular series, at the WACA here tomorrow. Top guns Sachin Tendulkar and Virender Sehwag will resume their opening stand which fetched them two century stands in as many matches before injury intervened and so is the case with Yuvraj Singh who is back after missing a game because of ear infection. Former India wicketkeeper Nayan Mongia says he is currently keeping his fingers crossed in an efforts to make a comeback into the national team. in the Deodhar Trophy cricket Tournament here today. Ricardo Powell hit a half-century for the West Indies before rain wrecked the third one-day international against South Africa at Kingsmead here. The West Indies made 147 for eight in an innings reduced to 40 overs after two interruptions for rain. Soccer giants Mohun Bagan have suspended their Brazilian striker Jose Barreto and demanded compensation of Rs 1 crore from the player for alleged gross acts of indiscipline and deserting the club mid-season. India will take on Malaysia in their opening Pool A match of the fifth Asia Cup Women’s Hockey Championship at the Dhyan Chand National Stadium here tomorrow at 3 p.m. Japan will meet Singapore in the opening match at 10.30 am in Pool B followed by matches between Korea and Sri Lanka and China and Kazakhstan. Andhra Pradesh won the gymnastics team title in gymnastics, securing 160.40 points at the National Sports Festival for Women (Group-I) here today. Punjab with 153.37 points finished runners-up while West Bengal were placed third with 153.25 points. The first Punjab Games, involving both the Indian and Pakistan Punjab provinces, would be held in Patiala in November this year, Raja K.S. 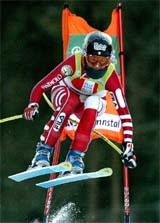 Sidhu, secretary of the Punjab Olympic Association, said today. The Indian Olympic Association was planning a 'New Delhi to Islamabad vintage car rally' on the eve of the ninth SAF Games to be held in Islamabad in March this year, a top official of the IOA said here today. Sukhdev Singh secured the first position in 200 metres and 400 metres on the inaugural day of the 49th annual sports and athletic meet of DAV College here today. Inclement weather forced the organisers of the Kila Raipur Sports Festival to postpone the games. The 70th edition of the festival, commonly known as Rural Olympics, that was slated to commence on Friday could not be kicked off as per the programme since heavy downpour and winds on January 30 afternoon forced the Grewal Sports Association, the organisers to reschedule the opening ceremony. Justine Henin-Hardenne beat her fellow Belgian Kim Clijsters 6-3, 4-6, 6-3 in the women's singles final at the Australian Open today. Henin-Hardenne, 21, added the Melbourne Park trophy to the French and U.S. Open titles she won last year to strengthen her hold on the number one ranking. "It's a pleasure to play in Australia, I'll be back again next sure," a beaming Henin-Hardenne said. "I want to congratulate Kim for a wonderful tournament. She wasn't sure whether she could play but she fought a lot." Clijsters, who also lost to Henin-Hardenne in the Paris and New York finals, has been troubled by an ankle injury for the past month and said she was satisfied just to make the final. "I think she played a great final and in the end she was too good so well done," Clijsters said. "This has been an incredible two weeks for me. Two-and-a-half weeks ago I didn't even think I'd even be able to participate. "So although I lost, I'm still very thankful to so many people who helped me get out here." Henin-Hardenne swept through the first set in 32 minutes with two breaks of serve then had to overcome a determined fightback from Clijsters to seal the title on an overcast centre court. After a tentative start by both players, Henin-Hardenne grabbed the first break in the fifth game after second seed Clijsters double faulted to gift her opponent a break point. Clijsters, with her fiance Lleyton Hewitt watching from the stands with Australian golfer Greg Norman, netted a forehand on the next point to hand Henin-Hardenne a 3-2 lead, which the top seed quickly extended to 4-2. Clijsters, 20, saved one set point but could not stop Henin-Hardenne from breaking her serve again in the ninth game to claim the first set. Henin-Hardenne raced to 4-2 lead in the second set when she broke in the sixth game before Clijsters fought back to win the next four games and level the match at one set all. Clijsters survived a break point before serving out the set. The 21-year-old Henin-Hardenne, however, regained the initiative at the start of the deciding set. 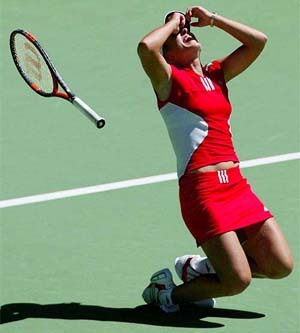 She raced to a 4-0 lead but had to weather another Clijsters storm before claiming the title. Clijsters pulled back to 3-4 but dropped serve in the eighth game after her forehand was ruled long by the umpire. Top of the world and seemingly untouchable, Roger Federer is a red-hot favourite to slay Russian goliath Marat Safin in the final of the Australian Open tomorrow. After becoming the first Swiss man to reach number one, second seed Federer will be anxious that his ascent to the top of the world rankings does not fall flat against a resurgent Safin. The Wimbledon champion pulverised third seed Juan Carlos Ferrero 6-4, 6-1, 6-4 after convincing wins against Lleyton Hewitt and nemesis David Nalbandian. However, Federer knows the danger posed by Safin. 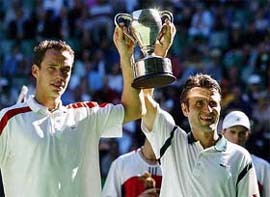 Now ranked 86th after an injury-plagued 2003, Safin won five-set battles against top seed Andy Roddick and defending champion Andre Agassi to reach his second Melbourne final. "Marat has definitely got the game to win these tournaments," said Federer, who is playing his first grand slam since splitting from Swedish coach Peter Lundgren. Former world number one Safin, who ended Agassi's 26-match win streak in Melbourne with a 7-6, 7-6, 5-7, 1-6, 6-3 semi-final victory, has already made a mockery of his low ranking. Safin has been making up for a frustrating 2003 — during which he won just 12 matches — and will be on a mission to become the first unseeded Australian Open champion since Mark Edmondson won in 1976. "I came here to try to win it," shrugged Safin, who lost the 2002 final to Sweden's Thomas Johansson. "Federer, he has great talent. You have to be careful with him but this is a completely different final. I'm full of confidence and it's a completely different story." Federer, who has prepared for his matches by hitting with Swiss juniors, is taking nothing for granted. He has beaten Safin three times out of four but each time on clay. "He's really tough on this surface. You can't get up on him with a kick serve because he's so tall and so strong with his backhand," said Federer, who has never played Safin on a hardcourt. For Safin, fatigue could be a critical factor. He has battled through three five-setters in six matches. The 2000 US Open champion could barely stand after his gritty win over Agassi, although an extra day of rest will have helped the recovery process. The last unseeded player to win a grand slam title was Goran Ivanisevic at Wimbledon in 2001 but Safin will need to find another level altogether to beat an inspired Federer. Federer, meanwhile, has everything to lose. Fourth seed Rastogi was upset by eighth seed Gael Monfils of France in straight sets 6-2 6-2 at the Margaret Court Arena, according to information received here. The 16-year-old Rastogi had defeated Italy’s Fabio Fognini 6-1, 7-5 in the quarterfinals. The All-India Tennis Association (AITA) has taken instant note of promising youngster Karan Rastogi’s heart-warming performance in the boys singles of the Australian Open Tennis Championship at Melbourne on Friday when he was included as the “fifth member” of the Indian Davis Cup team to play New Zealand from February 6 to 8. AITA secretary Anil Khanna said here today that he had had a telephonic talk with Davis Cup captain Leander Paes before taking the decision to include Karan Rastogi in the Cup team. Former captain Ramesh Krishnan, who stepped down as the non-playing captain in September last year, was also present when Mr Khanna made the announcement here today. The AITA had also named national hard court champion Vishal Punna of Andhra Pradesh in the Davis Cup team as the fourth member when news emanated of Prakash Amritraj’s injury and his unavailability for the forthcoming Cup tie. The other members of the Davis Cup team are captain Leander Paes, who is back in fine form, Mahesh Bhupathi and Rohan Bopanna. Karan Rastogi, seeded fourth, defeated Fabio Fognini 6-1, 7-4 of Italy to sail into the semi-final of the boys singles. Karan is presently ranked eighth in the ITF World Junior Rankings. Mr Anil Khanna said “this is a reward for Karan’s fine performance in the last one year. Karan has come up through the Junior Development Programme of the AITA”. Karan became the youngest player to qualify for an ATP Challenger event when he came through three tough qualifying rounds in the Delhi ATP Challenger in April last year. Meanwhile, Karan Rastogi and other top juniors like Tushar Liberhan and Divij Sharan will participate in the Adidas ITF Junior Tennis Grade II Tournament to be held at the Delhi Lawn Tennis Association courts in New Delhi from February 2 to 7. The Indian girls challenge will be spearheaded by Madura Ranganathan. This is the first time that India would be hosting a Grade II event. Mr Anil Khanna said considering the quality and number of entries this tournament has been attracting over the years, the ITF has upgraded this event to Grade II for 2004. Players from 17 countries, inclduing Australia, Russia, Uzbekistan and Ukraine, will participate in the event. The tournament will provide a platform for budding players like Rupesh Roy and junior national champion Navdeep Singh to prove their mettle. India would return to near full strength when they take on world champions Australia in a dry run, before the finals of the triangular series, at the WACA here tomorrow. Top guns Sachin Tendulkar and Virender Sehwag will resume their opening stand which fetched them two century stands in as many matches before injury intervened and so is the case with Yuvraj Singh who is back after missing a game because of ear infection. Still, the regular breakdown of cricketers could not have passed without taking a toll as Anil Kumble is surely out for the remaining two league games, as well as probably for the finals. Kumble’s absence is a boon for left-arm spinner Murali Kartik, who would be persisted with tomorrow. He has a good chance of staying in for the best-of-three finals. Indian captain Sourav Ganguly has confirmed his faith in Kartik and supported the presence of at least one specialist spinner in the tourists’ eleven. “Kartik played well in that truncated game in Sydney. He probably wouldn’t have got that chance if Kumble was fit. It is for him and it’s time for him to make the most of it. The bounce in the wicket will also support him,” he said. “There’s a huge, huge place for a genuine spinner,” Ganguly said. Amidst all the injury blows, VVS Laxman has been like a rock of Gibraltar and his three hundreds in one week have literally induced the fear of god among bowlers. With Kartik in the team, and Ajit Agarkar and Irfan Pathan assured of their berths, the 11th member’s place in the side will be contested between Ashish Nehra and Laxmipathy Balaji. Nehra, once a regular bearer of new ball, cannot be seen as an automatic starter in tomorrow’s game. Both India and Australia are in the finals though the latter have a 2-1 advantage over the tourists in the league phase which Ganguly’s men are looking to rectify. The line-up of both the sides has been fiddled around a bit in the last couple of weeks because of their rotation policy. Australia’s regular captain Ricky Ponting has been rested in this game but Adam Gilchrist returns after being given a break in the last couple of games. So is the case with pacer Jason Gillespie who did not play in the last two games against Zimbabwe but has now been pressed into service. Gilchrist confirmed David Hussey, the 29-year-old Western Australian cricketer, would be making his international debut in front of home crowd. He and Katich will come in place of Ponting and an injured Michael Bevan. Hussey has been a remarkable cricketer in domestic cricket for Australia for years now. He had an outstanding debut session in county cricket in 2001 when he amassed 2055 first class runs, including 329 in one innings against Essex for Northamptonshire. A qualified school-teacher, Hussey’s batting comes with the added benefit of both leg-spin and medium-pace in his cricketing armoury. Hussey has been around for long, scoring over 12,000 runs in nine seasons for Western Australia. He has more than 5000 runs in 146 one-day games, as well. Except for Hussey, Australia too are not looking for too many experiments in their line-up. Gillespie, Brett Lee and Brad Williams would be thrown at the Indians in what still is a fairly quick WACA track. India: Sourav Ganguly (captain), Sachin Tendulkar, Virender Sehwag, Rahul Dravid, Yuvraj Singh, Rohan Gavaskar, VVS Laxman, Ajit Agarkar, Murali Kartik, Laxmipathy Balaji, Ashish Nehra and Irfan Pathan. Australia: Adam Gilchrist (captain), Matthew Hayden, David Hussey, Damien Martyn, Simon Katich, Andrew Symonds, Michael Clarke, Jason Gillespie, Brad Williams, Brett Lee, Ian Harvey and Brad Hogg. Speaking to mediapersons after inaugurating ‘IT Cricket Cup’ 2004, with ten IT teams, at the Poona Club ground here this morning, the ex-international said: “I have been working hard and my form in domestic cricket this season is a refection of my good form”. Mongia, who represents Baroda in the Ranji trophy tourney has scored more than three hundreds, batting at number 3 position and claimed more than 25 wickets behind the stumps, though his team did not qualify for the Plate matches. Answering a query Mongia said that he had always been requesting the Indian selection committee to come forward and explain the reason for keeping him out of the team. Fine half centuries by M.S.K. Prasad and Ganeshwar Rao helped South Zone defeat North Zone by three wickets in the Deodhar Trophy cricket Tournament here today. A Chopra c Suresh b Yohanann 15, G Gambhiar c MSK Prasad b Yohanann 24, D Mongia c Suresh b Yohanann 21, M Mihas c Suresh b Vardhan 12, A Jadeja not out 48, R S Sodhi c Khalil b Ganesh 53, S Singh lbw b Nair 4, A Ratra b S Nair 14. Bowling: Doda Ganesh 10-0-49-1, Tinu Yohanann 10-0-37-3, Vishnu Vardhan 8-1-36-1, Srikumar Nair 9-1-30-2, S Suresh 6-0-21-0, V Sivaramakrishna 7-1-34-0. M S K Prasad c & b S Singh 59, V Sivaramakrishna c G Singh b S Singh 23, S Suresh b Sanghvi 11, Venugopal Rao c Chopra b Mishra 6, Ganeswar Rao not out 58, Srikumar Nair c G Singh b Minhas 23, Ajay Kudva c Chopra b S Singh 11, Vishnu Vardhan st Ratra b Mishra 1, Ibrahim Khalil not out 2. Ricardo Powell hit a half-century for the West Indies before rain wrecked the third one-day international against South Africa at Kingsmead here. The West Indies made 147 for eight in an innings reduced to 40 overs after two interruptions for rain. South Africa, with an adjusted target of 169 in 40 overs, were 15 for one when rain drove the players off the field for the third and final time yesterday. Fall of wickets: 1-3, 2-52, 3-79, 4-118, 5-119, 6-134, 7-146, 8-146. 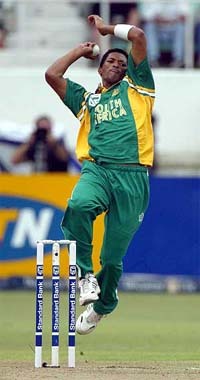 Bowling: Pollock 8-4-16-1, Nel 8-2-25-1, Ntini 6-0-23-1, Klusener 8-0-46-2, Peterson 7-0-22-0, Kallis 3-0-8-3. Announcing this at a press conference here today, the club said a decision in this regard was taken on January 28 by the three high court-appointed special officers. India have been grouped together with China, Malaysia and Kazakhstan while Korea, Japan, Hong Kong and Sri Lanka form pool B. India, whose best in the Asia Cup has been a silver-medal finish at the National Stadium in New Delhi in 1999 when they lost to Korea in the cup clash, hope to figure among the semifinalists this time. Former Olympian and tournament director M.P. Ganesh said the Indian girls had the potential to be among the semifinalists while national coach M.K. Kaushik was confident of the hosts bagging the bronze. Incidentally, Kaushik was the chief coach when the Indian eves won the bronze in the third edition at Hiroshima in 1993 and were fourth in the second edition at Kong Kong in 1989. There have been many changes in the team after India won the Commonwealth gold with the experienced players giving way to a new bunch of girls, mostly from the Adivasi-tribal belt of Jharkhand and products of sustained coaching schemes of Haryana. These girls were the backbone of India when they won the gold in the inaugural Afro-Asian Games at Hyderabad last year. The senior players were either replaced or they opted out due to family reasons. Kaushik, who was reappointed the chief coach of the women’s team six months back, has been working hard with the girls ever since to perfect their scoring skills from ‘set pieces’ to penalty corners. Thrust has been put in improving the girls’ stamina and endurance, too. Kaushik seems to have done a fine job as the girls looked in fine nick on the eve of the championship. But still, even Kaushik admits that the hosts will find the going tough when they cross sticks with second ranked China, sixth-ranked Korea, who have been winning the title for the past three editions, and ninth-ranked Japan. India, presently occuping the 11th slot in ranking, will have to do tight-marking to beat back the hustling tactics of the Chinese, the Koreans and the Japanese who are strongly-built, speedy and skilful. But Kaushik was confident that the young ladies would pass the test by fire with their positive attitude and the will to win, though the Koreans had made a mockery of the home advantage theory when they outplayed the Indian girls in the title clash in 1999. The team, captained by Surajlata Devi, whom Kaushik had spotted as a 14-year-old rookie durig his first stint as the women’s coach in 1993, is a fine blend of youth and experience. The team boasts of talented girls like goalkeepers Helen Mary and Dipika Murthy, Mamta Kharab, who slotted home the match-winner against England in the Commonwealth Games title clash, Saba Anjam, Surinder Kaur, Jyoti Sunita Kulu, Shanggai Chanu, Jasjeet Kaur, Adline Kerketta, Pushpa Pradhan and Manju (all forwards), Suman Bala, Kanti Baa and Binita Toppo (all full backs) and Subhadra Pradhan, Masira Surin and Sumari Tete (half backs). The winners of the Asia Cup will qualify for the 2006 World Cup to be held in Spain, but the Indian squad will utilise the event as a spring board to build their team for challenging future campaigns like the Champions Trophy 2005, Asian Games 2006 and the Olympic Games 2008. India have not qualified for the Athens Olympic Games 2004, and this lingering hurt they hope to wipe out with a memorable display in the Asia Cup. Andhra Pradesh won the gymnastics team title in gymnastics, securing 160.40 points at the National Sports Festival for Women (Group-I) here today. Punjab with 153.37 points finished runners-up while West Bengal were placed third with 153.25 points. Sukhbir Kaur of Punjab bagged the gold in the all-round individual championship with 32.76 points, while M Sridevi of Andhra Pradesh got the silver with 32.59 points and Rohika, also of Punjab, got the bronze with 32.53 points. Vaulting: Rohika (Pun) 8.50 points gold; M Sridevi (AP) 8.40 points silver; A Priyanka (AP) 8.20 points bronze. Uneven bars: Sukbir Kaur (Pun) 7.40 points gold; M Sridevi (AP) 7.30 points silver; Meenakshi (Pun) 7.20 points bronze. Balancing beam: Rohika (Pun) 8 points gold; K Srilatha (AP) 7.70 points silver; Dipa Karmakar (Tripura) and Sukvinder Kaur (J and K) 6.80 points each bronze. "The Punjab Games will be a symbol of unity between the people of India and Pakistan and this event will mark the beginning of a new sports culture between the two countries," Mr Sidhu who arrived here to attend the South Asian Sports Federation (SASF) meeting said. The Indian delegation to SASF also included Mr Randhir Singh, general secretary of the Indian Olympic Association, Mr Aslam Khan, vice-president of the IOA, and Mr Avinash Kohli, president of the Indian Kayaking and Canoeing Association. "We will be discussing this matter with the Pakistani authorities and hopefully we will be organising this unique event two or three-day before the Games," said Mr R.K. Anand, member of Parliament, and a vice-president of the IOA. Gurpreet Singh won the first position in 1500 metres while Gurdas stood first in javelin throw. In the girls' section, Harinder stood first in shot put and in obstacle race Manpreet was the winner. 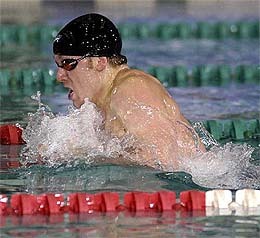 Sandeep won in 200 metres. Earlier, Mr Jugal Kishore Sharma, MLA, inaugurated the meet. Inclement weather forced the organisers of the Kila Raipur Sports Festival to postpone the games. The 70th edition of the festival, commonly known as Rural Olympics, that was slated to commence on Friday could not be kicked off as per the programme since heavy downpour and winds on January 30 afternoon forced the Grewal Sports Association, the organisers to reschedule the opening ceremony. Only a few events including two hockey matches in the junior section, rifle shooting, three heats in the bullock cart race and dare-devil horse riding skills by a nihang were held, that too in rains. Due to the rains, Grewal Stadium, main venue of the festival, became slushy. The hockey ground at the government school, where the matches in the senior as well as junior sections were to be played, was waterlogged rendering it impossible to conduct any match there in the coming three or four days. A large number of participants from all over the region and the neighbouring states who had gathered there to take part in the festival were disappointed as they had to return without taking part in any action. Though it did not rain today, overcast sky proved to be a hinderance in improving the ground conditions. This forced the organisers to postpone the event.